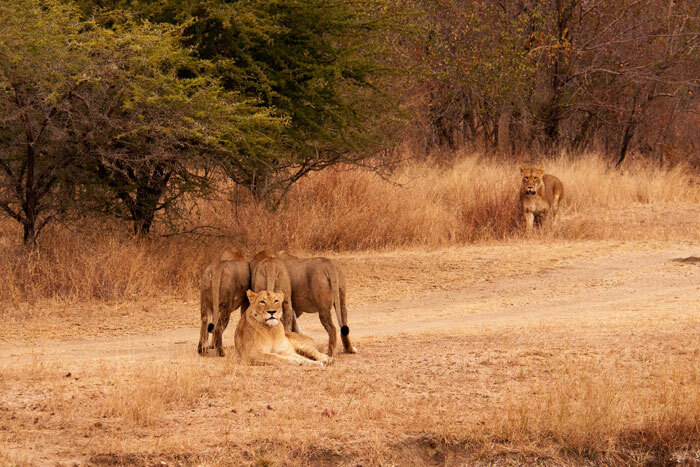 The week started with a very interesting sighting of the Tsalala Pride. Early one afternoon we heard lions fighting close to camp, and rushed to investigate. 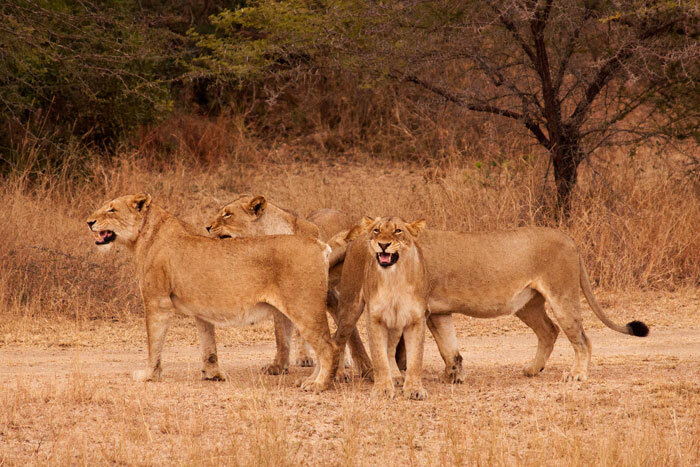 We found the 2 Tsalala Prides had met up – the 5 with the 2 tailless and the 4 young females (the ‘Breakaway Pride’), who are normally separate from one another and despite being related, seem to strongly dislike one another. To add to the chaos, one of the Majingalane Males was also present and mating with one of the older females – the one ‘with the tail’, also the mother of the 2 sub-adult youngsters born last year. The mating seemed to be more about the female trying to lure the male away from the others, than her trying to conceive. After this, she ran further away from the other females, all the while looking back to make sure he was following. 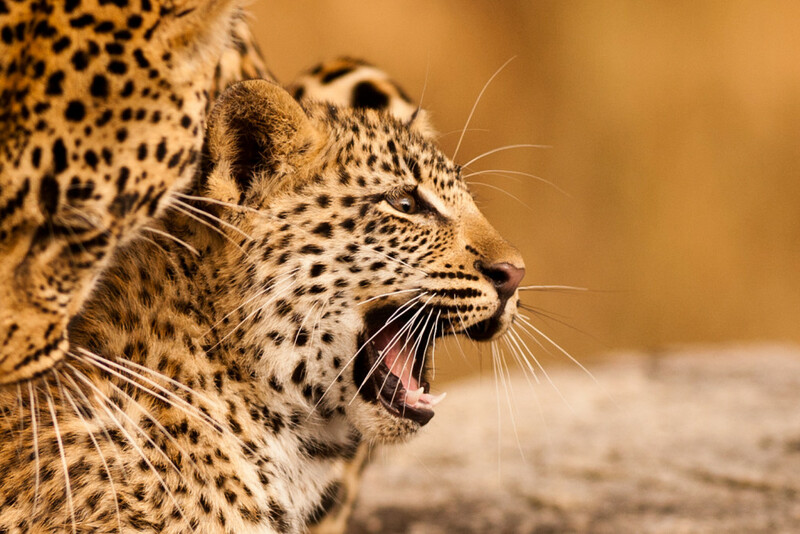 The Majingalane Male roared loudly after each time he mated with the female. Meanwhile, across the way, a friendly reunion was happening between the older Tailless female and her granddaughters, 3 of the Breakaways (the 4th had been chased off by the younger Tailless). This was very interesting to watch as they smelled each other and rubbed against one another, clearly very happy to be reunited. The older Tailless looked after these females until about a year ago when she left them to rejoin their mothers – the new Tailless and her sister. 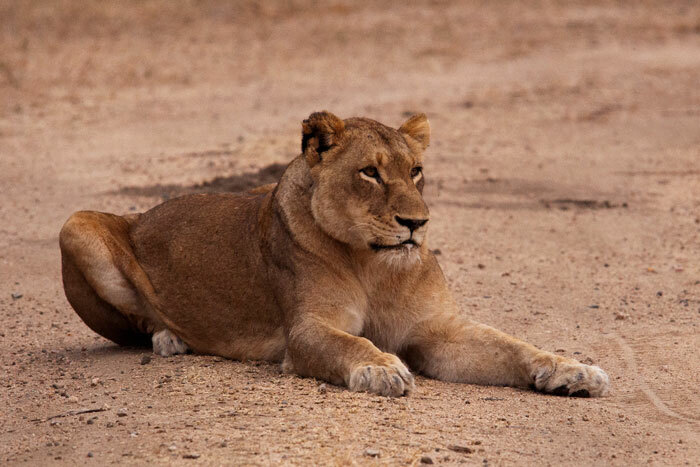 As their grandmother, she seems to be the only member of the Tsalala Pride interested in having them around! Happy and relaxed after the reunion, one of the Breakaways drinks at the pan. Then something even more interesting happened. After having chased the 4th Breakaway, the new Tailless returned. Upon seeing her, the 3 Breakaways leapt up and stood next to one another, as though forming a barrier between her and the old Tailless. The tension was building as they all stared at each other. 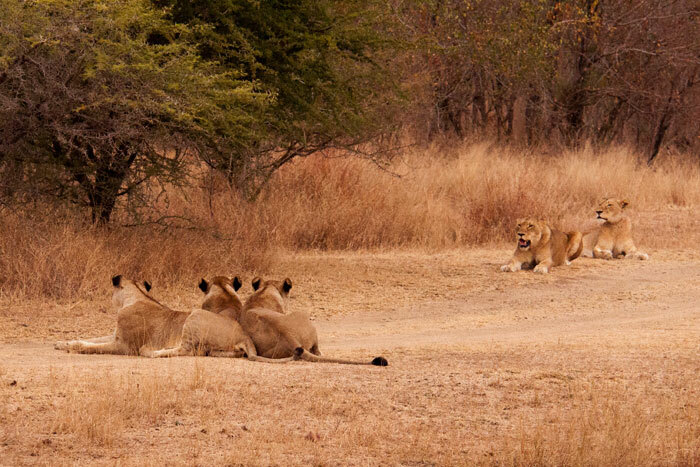 The 3 younger lionesses sat down, and the old Tailless slowly approached her daughter, the new Tailless. She greeted her with a soft call and a nose rub, as if to try and establish some peace. 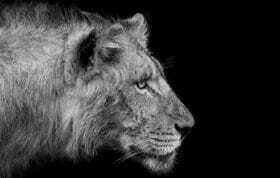 The new Tailless then laid down, panting from her chase of the missing lioness. They then all had a stareoff for the following half hour or so, as the new Tailless inched her way closer to the 3, seemingly unconvinced as yet by her mother old Tailless that she should be nice to them! Old and new Tailless lie together, still keeping an eye on the younger 3. New Tailless intensely stares at the Breakaways after inching closer yet again. She would eventually get close enough to have an interaction which was unfriendly at first but then they settled and all lay together for the rest of the evening. However, the next morning the two prides had separated again. 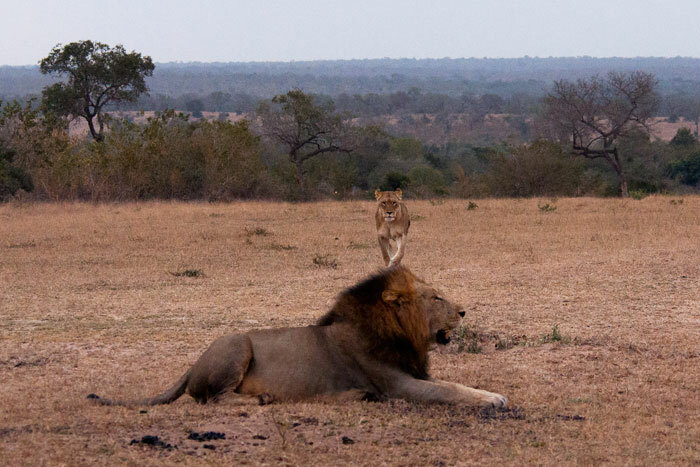 Meanwhile, the tail-ed Tsalala lioness was still luring the male further and further away from the others. They made it to the airstrip, when the male seemed to decide he didn’t want to go any further. 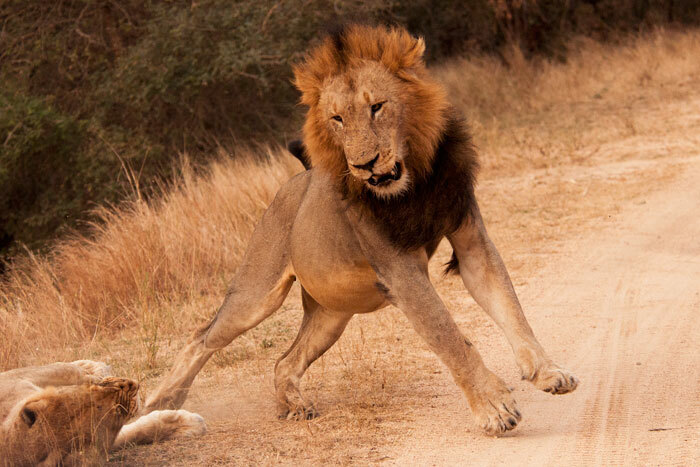 The lioness responded by turning back, running towards him and literally attacking him to get him to mate with her! It worked! 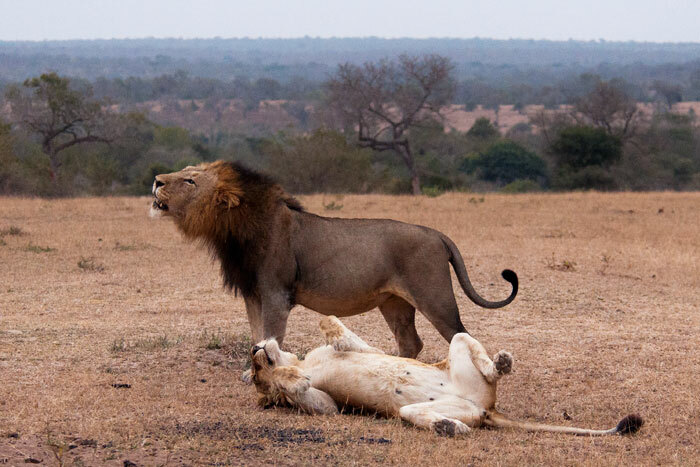 After mating, he roared again while she turned over – typical of lion and leopard females post-mating. This behaviour is thought to increase the chances of conception. An African Fish eagle watches the waters beneath for prey. 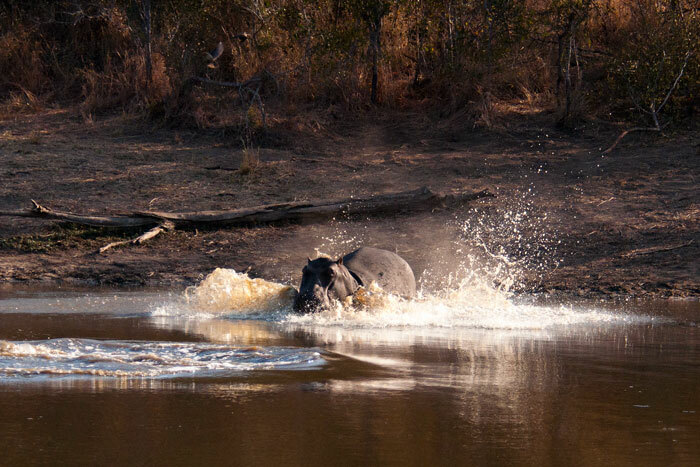 A hippo crashes into the water at Maidie’s Dam, after having gotten a fright from a nyala in the bush nearby. The Camp Pan Male follows the scent of the Tamboti Female. 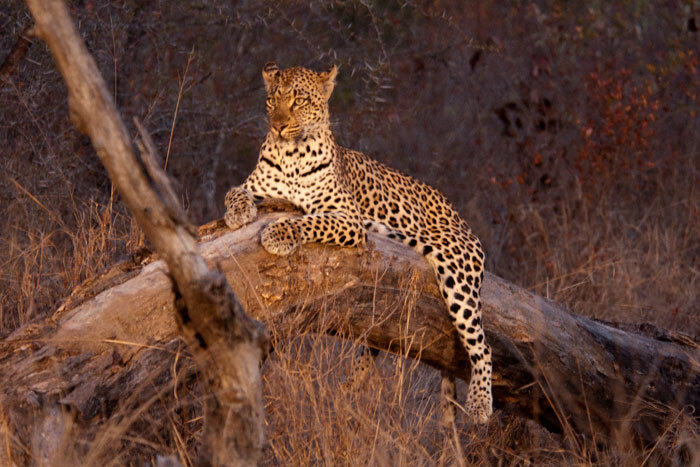 We found her a few days after she was last seen mating with the Maxabene 3:2 Young Male, the son of the Camp Pan Male. We thought they would still be together but he was nowhere to be found. His father, however, was in the area and upon getting her scent began trailing her. They eventually met up, and because she had been mating so recently, we expected them to mate. Instead, however, they had a friendly interaction involving lots of ‘chuffing’ (sneeze-like leopard sounds indicating a friendly intention towards one another) but then went their separate ways. Their meeting didn’t go by without a bit of a flirt from the Tamboti Female, however! She draped herself over a fallen tree and looked over at him, perhaps hoping to attract his attention. It didn’t work! 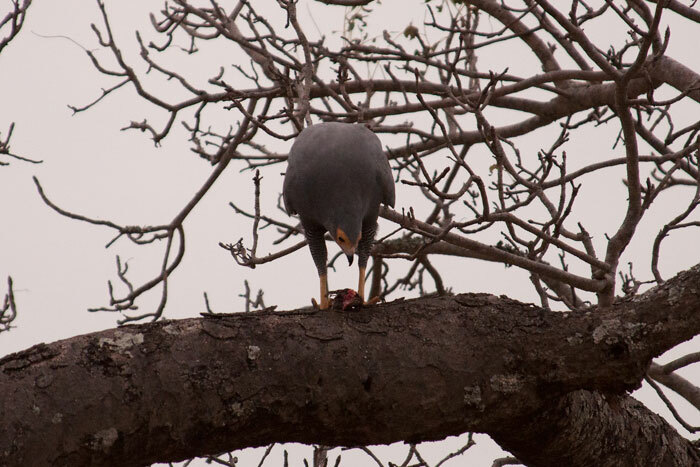 An African Harrier-hawk, or Gymnogene, feeds on its prey. We couldn’t tell exactly what it was, but think it may have been an unlucky squirrel. 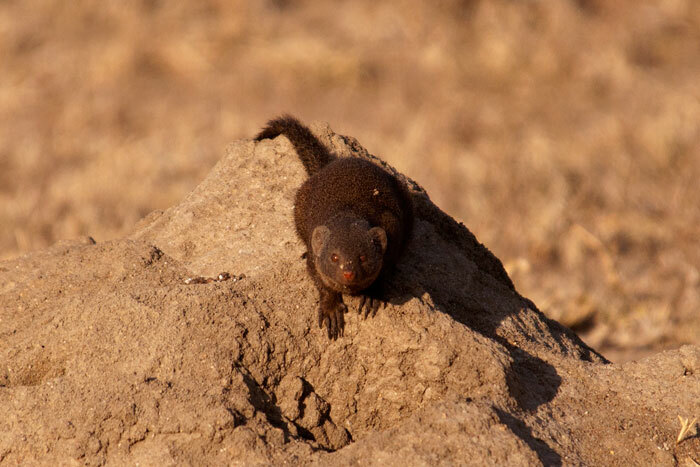 A Dwarf mongoose appears ready to pounce. They are very sensitive to cold, and can often be seen sunbathing on the sides of their termite mound homes in the chilly winter mornings. 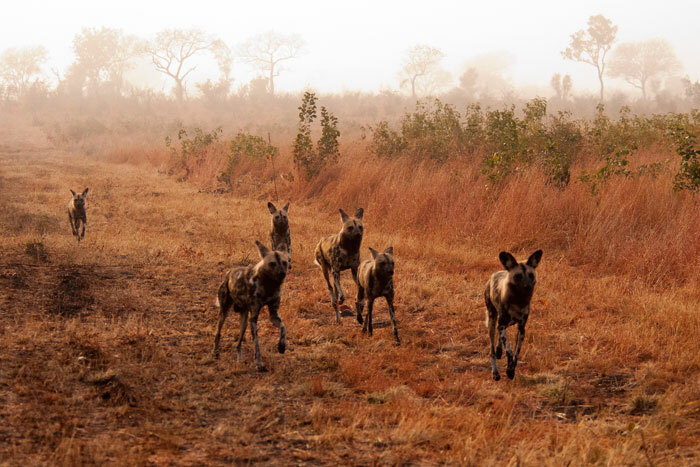 Wild dogs run in the morning mist. We had an extended from the pack this week, who stuck around for about 2 days, hunting but also checking out their old densites! We are hoping this may mean they are looking to move their densite soon, to an area where we can view them. 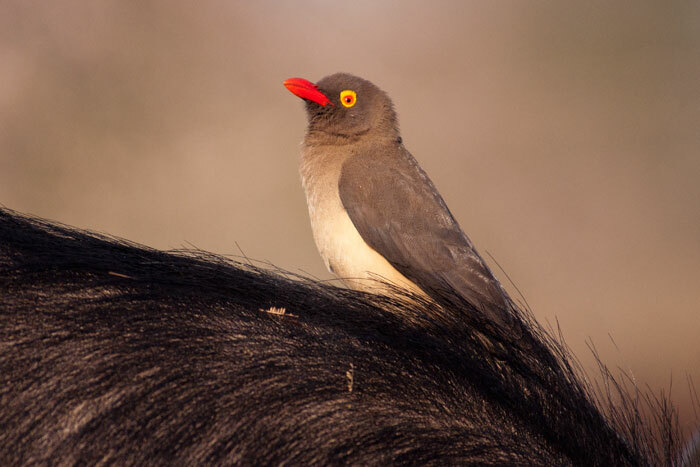 A Red-billed oxpecker on buffalo, in the herd of 1,000. 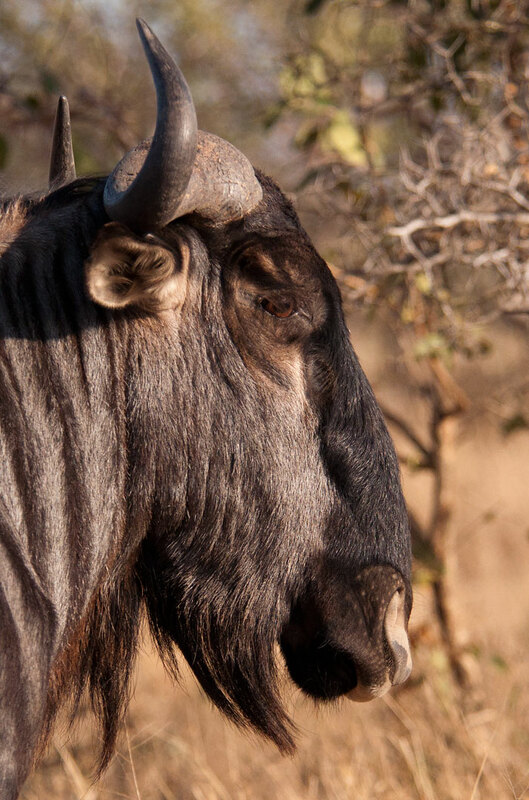 Not known for their classic beauty, the blue wildebeest or brindled gnu can still strike a nice pose when he wants! This indignant bull stood close to us, unwilling to move from his small territory to let us pass. A very full Tsalala youngster rests in the shade. 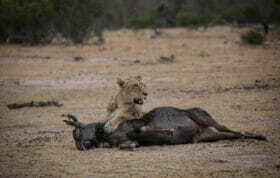 The Pride managed to kill a large kudu bull this week, and feasted on it for two days. 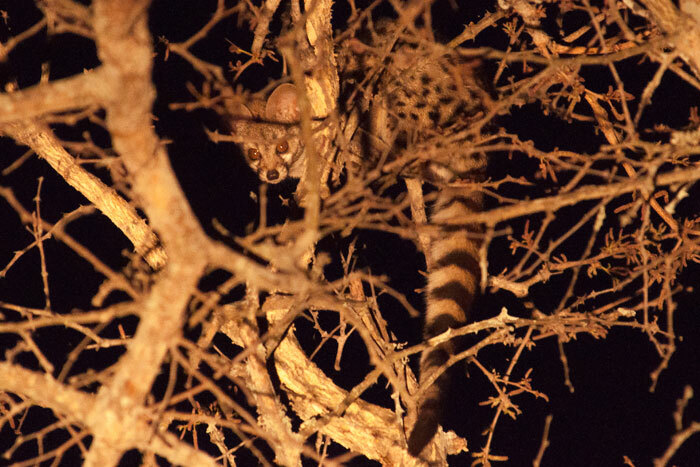 One of our favourite nocturnal creatures to spot – a Genet – balances in a tree after attempting to raid a weaver nest. 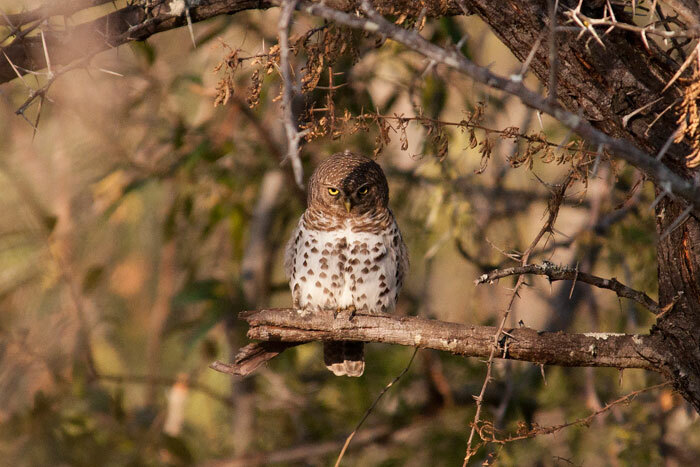 A Barred owl rests in the shade of an Acacia tree. 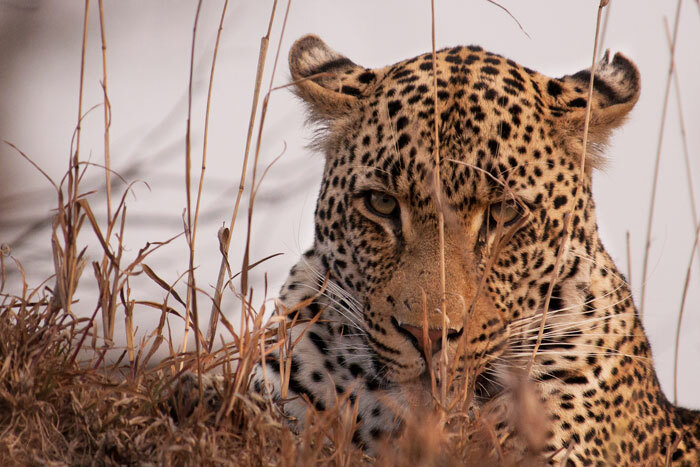 A highlight this week was the reappearance of the Nyeleti 4:3 Young Male. Last seen a few months ago hanging around camp often, he disappeared for a while. 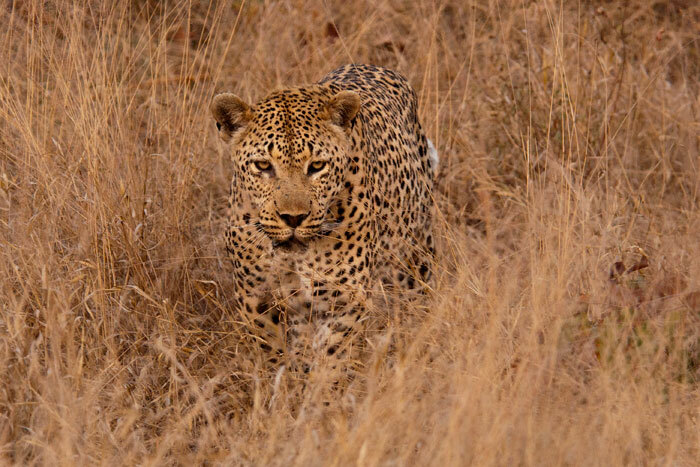 He had become a favourite amongst many rangers and trackers, so we hope he is back for good and will perhaps look to establish his territory within Londolozi. 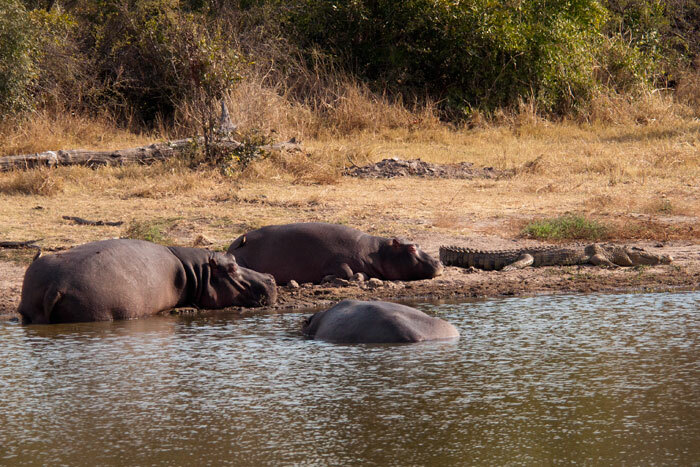 A common question from guests is how well hippos and crocs get along. As though on que one afternoon, we rounded the bend towards Taylor’s Dam after someone had enquired about their relationship to find this peaceful scene of both animals sunbathing together! Crocs do not prey on hippos, and since crocs are carnivores whereas hippos vegetarians, they do not compete for food. Therefore, where there is plenty of space in the water, they tolerate one another just fine. During the winter, the Dwarf mongoose becomes a more common sighting, because of the thinner vegetation, and their tendency to sunbathe. 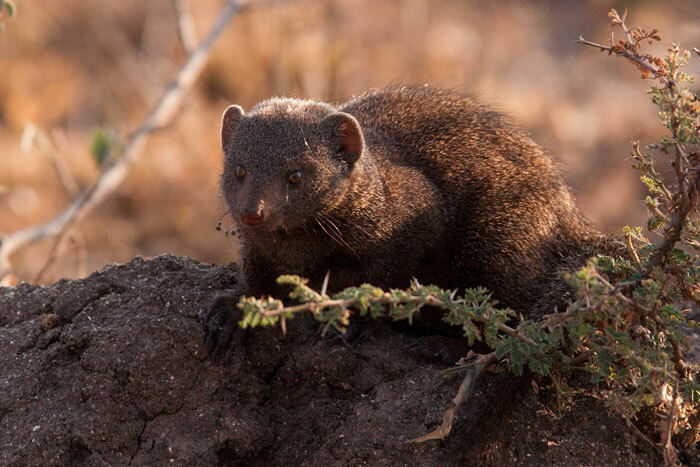 These brave and curious little creatures are always fun to watch, as they live up to their collective term of a ‘business of mongoose’ – always keeping themselves busy! 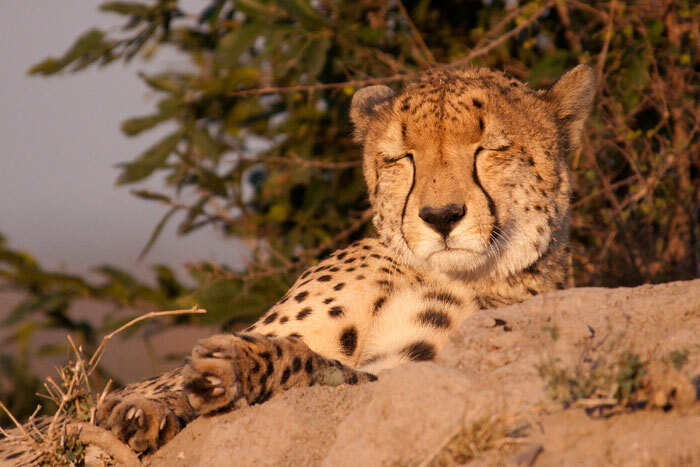 A cheetah sleeps atop a termite mound in the last light of the day. The young male is still hanging around, yet exploring different areas around Londolozi. 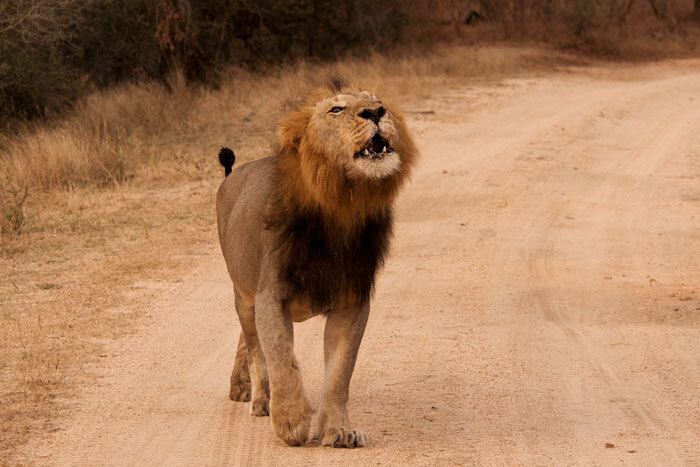 Unfortunately the most recent sighting of him was in an area full of lions, and whereas we don’t think he had any contact with them, he will most likely try to move far away from them. We hope we haven’t seen the last of him! His tendency to go up trees and onto termite mounds is always picturesque, and sometimes amusing as he clumsily climbs around. 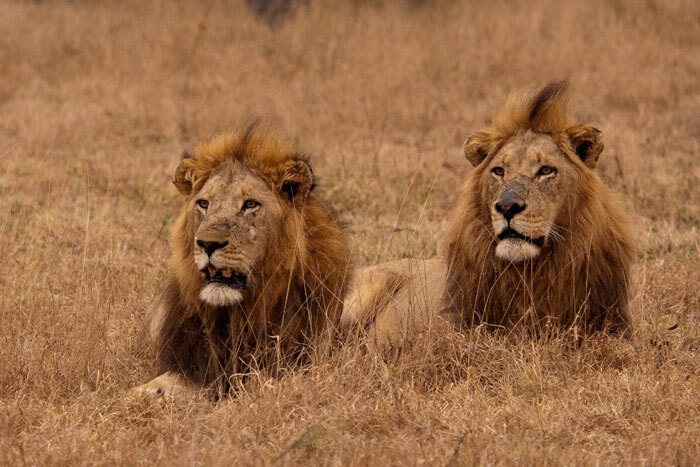 Two Majingalane Males stare attentively towards some impala alarming – but not at them. 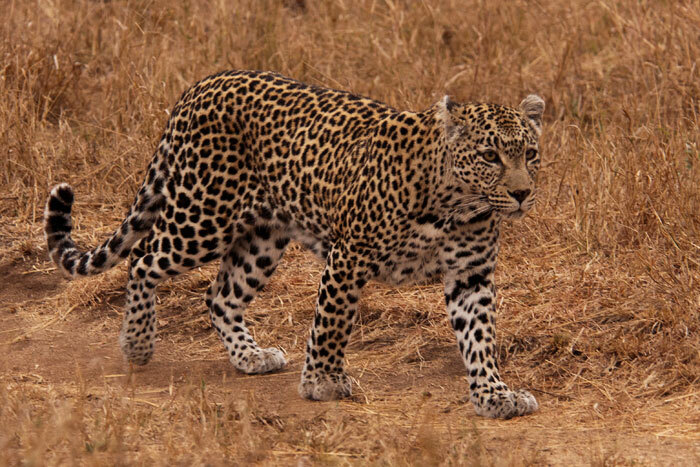 Soon after, the Nottens Female leopard appeared! 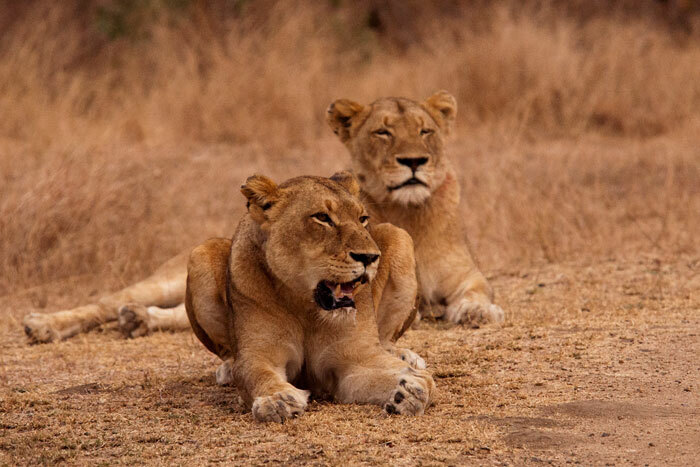 The lions looked as though they were deciding on whether to chase the leopard, follow the Sparta lionesses who had recently left them behind, or just relax. 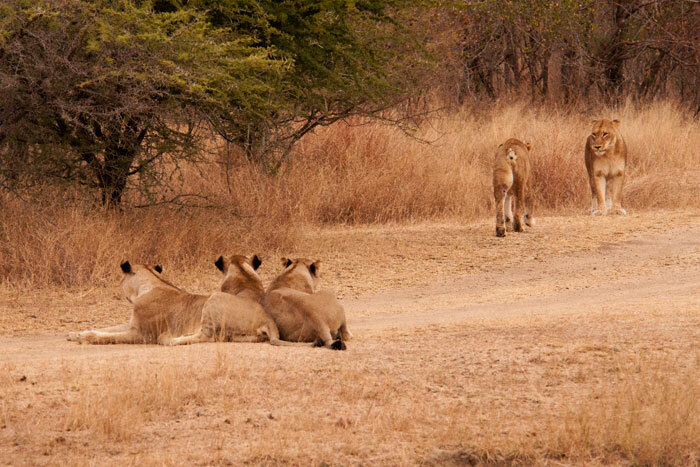 Eventually, they got up to follow the lionesses, but unfortunately they had waited too long. They called for them and tracked their scent for a while, but never found them again that day. 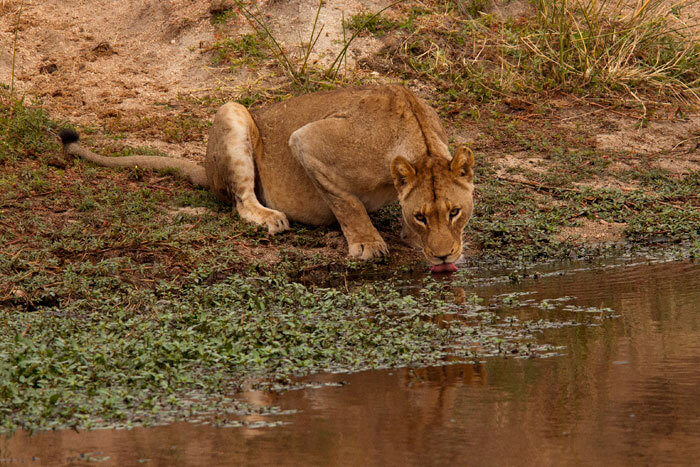 We’re not sure if the Nottens Female ever saw the male lions, although they definitely saw her, and she seemed to know something was awry by her nervous behaviour. She most likely smelled that there were lions around, but managed to get through the area without being chased. 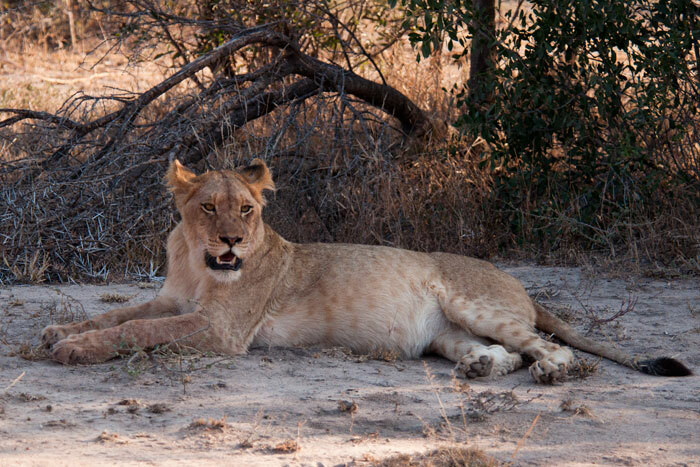 How fitting for our final sighting of the week to be of the Tsalala Pride yet again! 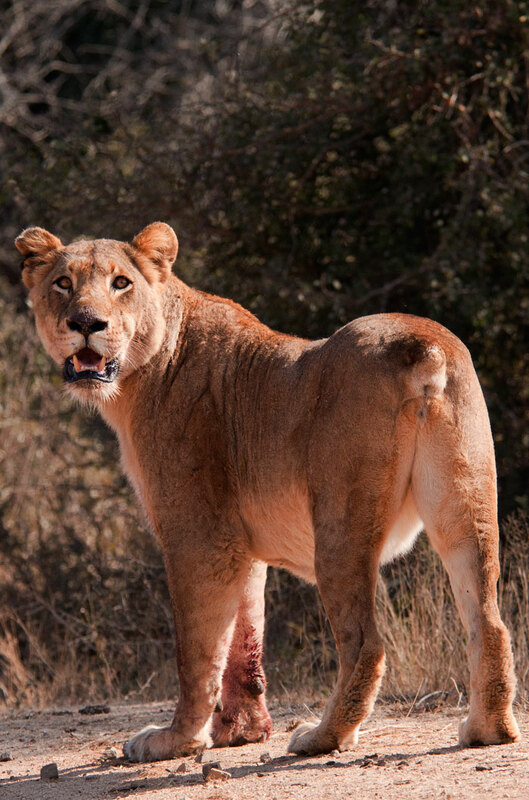 We bumped into the new Tailless just outside of camp worriedly looking for her Pride, bloodied from feeding on a kill. The two sub-adults responded to her contact calls by coming out of a thicket and greeting her. The touching reunion between the youngsters and their aunt was interrupted, however, by their apparent suspicion that something was after them. They ran away, turning back occasionally to check. 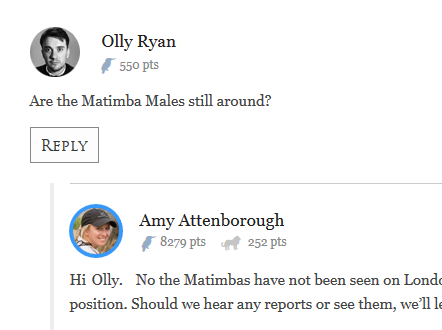 Nothing appeared, but we think they were worried about the Majingalane Males who were found nearby. Then, during breakfast, the 3 appeared in front of Pioneer and Founders Camps with the other lioness (with the tail – their mother) and a male, all chasing each other back and forth across the rocks in the river. 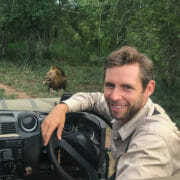 A troop of baboons and a very confused buffalo bull were also in the mix, making for a very interesting dining experience for our guests! 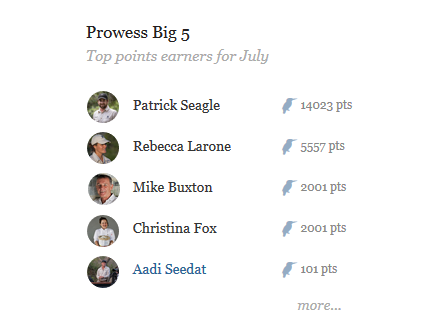 Excellent week Talley. 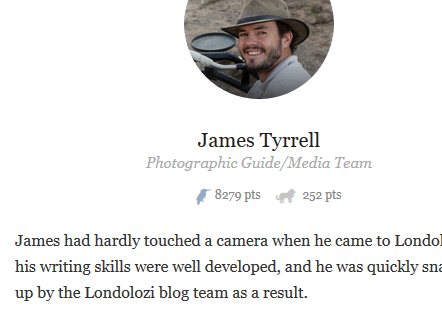 Thanks so much for the terrific blog. Interesting interaction of the Tsalala’s. 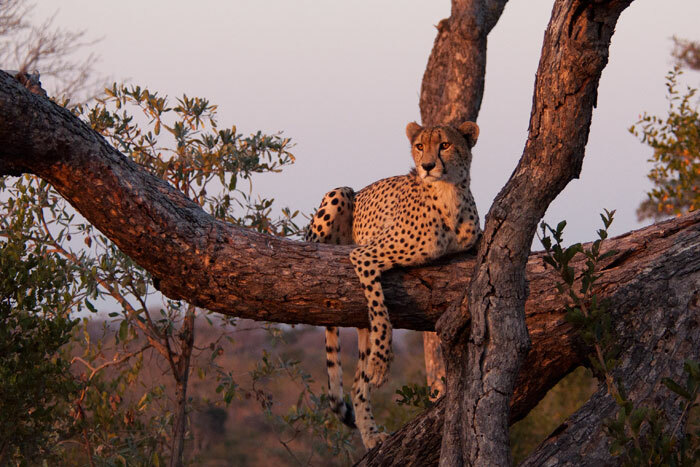 Love, love the picture of the cheetah on the tree branch! Thanks again Talley. 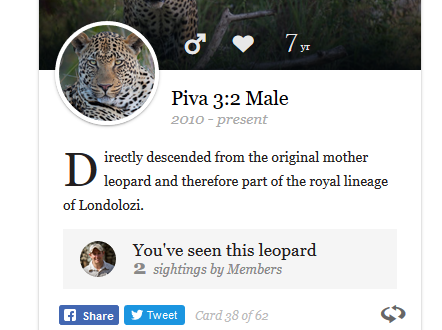 Interesting, the new tailless female seems to feel more connected to her sister’s cubs than her own adult daughters. BB seems to be comfortable in either group. Very interesting dynamic. 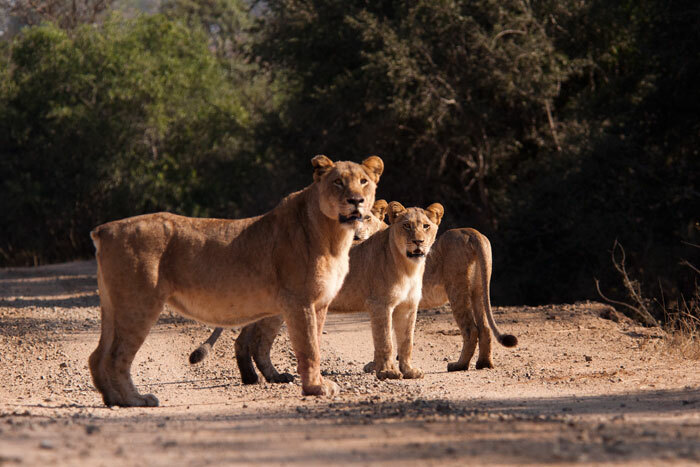 It would be interesting to see where the breakaway pride will settle-perhaps they may go back and settle with the southern males? Truly REMARKABLE pictures and story Talley! The Tsalala’s are my favorite pride, even though I love them all. So VERY HAPPY to hear they are doing well and trying to reunite…WOW, if they did, if the Older Tailless Lioness could broker peace amongst the generations, they would be such a dominant force…. :) would LOVE that!! My favorite picture is of the 3 standing shoulder to shoulder! Your close observation of lioness interaction was fascinating. Thank you for that informed look into their dynamics. 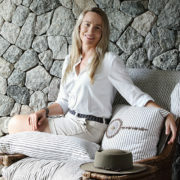 Another awesome blog.. I look forward to these every week! 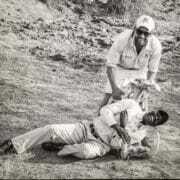 And the pictures make it all that more speccial..
What a fantastic collection of photos of the Tsalalas. The old tailless girl still looks amazing. 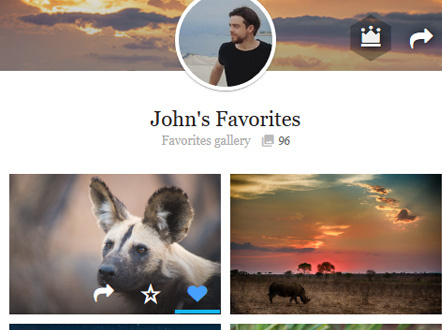 Thank you for sharing them and all the other photos as well. 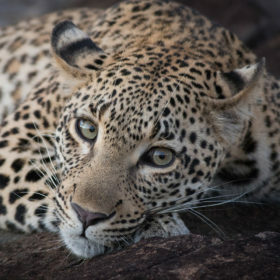 The Nottins girl is so pretty and yes, I hope the cheetah chooses to remain in the area too. Such an interesting week of lion behavior ! 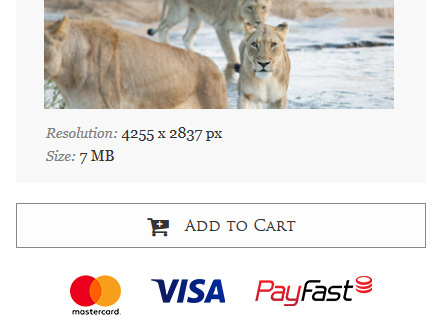 More spectacular photos Talley, especially the last one of the tailless lion! She looks like she’s striking a pose for the camera! 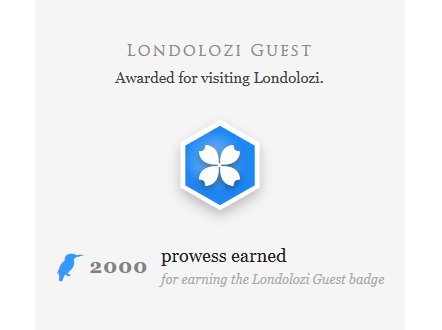 A quick word of awesome appreciation for making our 14th visit to Londo’s the best ever! 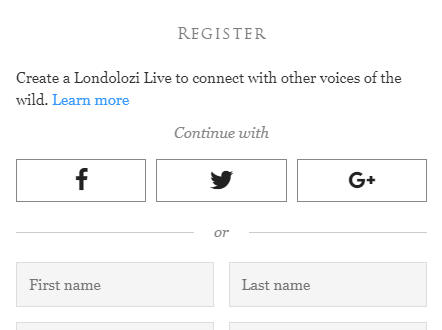 We’re still in Founder’s mode, and woke up this morning wondering why the Kruger coalition were so quiet? The kids can’t wait to tell their friends about the “new”, self-appointed, 4-legged, maned security guard posted at the bridge in front of room 4! I’m also planning to post his early evening roar on the blog, the image quality is sub-optimal due to Rob’s resolution to stick to low-light policy, but the audio is awesome! Many thanks! We’ll be back! Stunning sightings! Enjoyed every minute of viewing as if we were there! 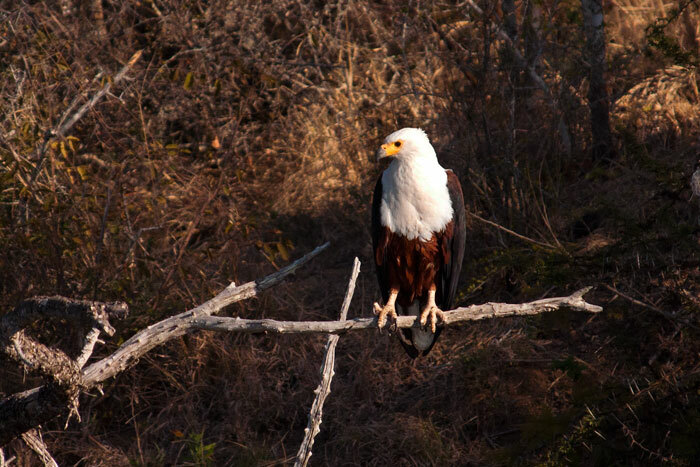 What a gorgeous fish eagle shot. 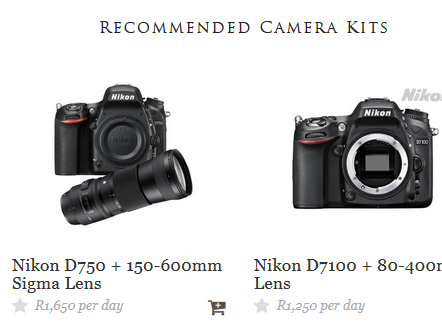 All are wonderful but I particularly like the fish eagle…and I am NOT a birder ….. this could make me one! Wow Talley – brilliant, what a week..
Oh Tallie, what a wonderful week you’ve had, so much excitement, makes me want to get back there very quickly, your pictures are fabulous, I’m on the hunt for a better camera. I’ve been making porridge but can’t quite get it as good as Excellent served us, what’s the recipe?